Is your organisation performing Modulus Checks and KYC checks? Do you know the scheme rules around them and why they are important? Read on for more information…..
Firstly, what are modulus checks and KYC checks? Modulus checking is a mathematical validation of sort code and account number combinations. It confirms that the account number that a customer has given you can validly be paired with the sort code that they have provided. It does not verify that the account details belong to the payer i.e. that they own that bank account but it does tell you if the bank account COULD exist. Modulus checking is different from a sort code lookup. With a sort code lookup, you are simply looking up the sort code of the bank or building society to see if it is correct and to see which bank and branch it relates to. KYC stands for ‘Know Your Customer’ and refers to the checks that Service Users should carry out to ensure that the person they are signing up to pay by Direct Debit is the person they claim to be and that they have the authority to agree to the Direct Debit. Next, what are your responsibilities as a Service User? The Service User (the organisation collecting the Direct Debits) has a number of different ways they can obtain and lodge the Direct Debit Instruction from the customer – as summarised below. The ‘rules’ for Service Users around Modulus checking and KYC checks are subtly different depending on which system you operate. 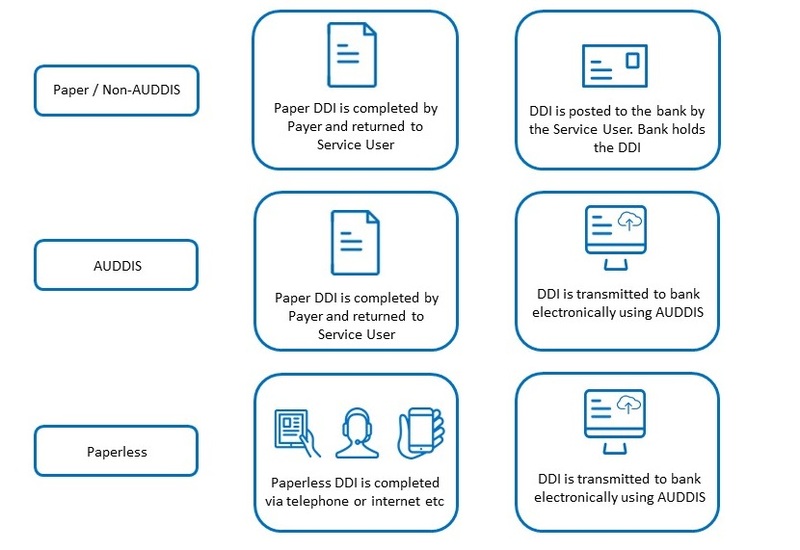 Collect a paper DDI and post DDI to bank (Non-AUDDIS) Primary responsibility for validation and verification rests with the bank (as the DDI is forwarded to them), however, it is strongly recommended that service users apply modulus checking and sort code validation when applying the DDI to their own system Service users are encouraged to check that the customer is who they say they are and that the details obtained are correct. Collect a paper DDI and send an AUDDIS transaction to the bank to lodge it The DDI is forwarded to the bank and most banks will operate a modulus checking facility, however it is strongly recommended that AUDDIS service users apply modulus checking and sort code validation when applying the DDI to their own system It is strongly recommended that AUDDIS service users undertake ‘Know Your Customer’ (KYC) checks in order to verify the payer and the account details before processing any Direct Debits. Collect a Paperless DDI and send AUDDIS transaction to bank to lodge it Service users must validate the payer’s account details by applying ‘modulus checking’, at ‘point of sale’ The service user MUST undertake ‘Know Your Customer’ (KYC) checks in order to verify the payer and the account details before processing any Direct Debits. Whilst modulus checking & KYC checks are strongly recommended for paper and AUDDIS users, it is mandatory at the point of customer signup when you operate Paperless Direct Debit, (PDD). Why is modulus checking at the point of customer sign up important? Reduces errors. Getting it right the first time takes far less time and effort than trying to sort out errors at a later time. If you discover that details provided are incorrect you can alert the customer to this and request correct details. Prevents subsequent payment runs being affected – reducing the number of returned payments and a costly correction process. It improves customer service. If a Direct Debit payment is not collected when a customer expects it to be they will most likely blame the collecting organisation for making the error, (even if they have provided incorrect details!). Avoiding errors prevents customer inconvenience which in turn ensures higher customer confidence and fewer aggravated phone calls! It allows Straight-Through-Processing (i.e. the data can be keyed in once and passed through for processing rather than any details having to be re-keyed). In turn this reduces administration costs and improves efficiency. How do I perform modulus checks? All Bacs approved software packages include sort code look up and modulus checking using ‘the Industry Sorting Code Directory (ISCD) and the Extended Industry Sorting Code Directory’ (EISCD). Both these directories are available from VocaLink and published weekly so it is important to ensure that any software you use is regularly updated. Bacs software will apply the check at the point of sending the file to Bacs. This is important as entries with incorrect account numbers are usually rejected either by Bacs or the receiving bank and returned as unpaid or unapplied. These software packages do not necessarily apply the checks at the point of customer signup however and this is when, particularly with Paperless Direct Debit, you have the ability to check the details with the customer and correct any unintentional errors. If you are collecting PDD, there are various options available for both sort code lookups and modulus checks. Vocalink provide a free online service for example where you can access the EISCD. You need to register to use it (a simple process) and you can then check a small number of sortcodes each day. Other services (for both sortcode checks and modulus checks are also available if you search the internet. They can be expensive but some providers will offer a trial use if you register or will allow you to check a small number of details. The most suitable option for your organisation will depend on factors including the number of checks you have to make, the number of administrators making these checks and the frequency with which you require checks to be conducted. It is also worth remembering that some building societies have accounts that use nonstandard account details. Service users can obtain the ‘Crediting and Debiting Building Society Accounts’ document from Bacs to validate these sort code and account number details. Why are KYC Checks important and how do I perform them? The Bacs Rules recommend that all Service Users should undertake ‘Know Your Customer’ (KYC) checks (and it is mandatory for those operating Paperless Direct Debits). This in order to verify the payers details before processing any Direct Debits. Failure to perform KYC checks may lead to unauthorised / fraudulent DDIs being set up resulting in Direct Debit indemnity claims being raised. A list of measures to assist in verifying the payer’s details is available from Bacs. You will need to log into to the resource centre to download these. Clear Direct Debit are a Bacs Accredited Direct Debit training company and a Bacs Approved Bureau. If you have questions about any aspects of Direct Debits, including modulus checks and KYC checks, we are happy to help provide answers. Contact us today for help.